Top left: Retailers surveyed find that most customers tend to want the brands they have had before — unless they had a bad experience with the product — and not many customers will require the shoes to have the same technology. Top right: Customers are most interested in brand names and many often enquire about a shoe’s name rather than the support features or cushioning it is able to offer them report retailers. 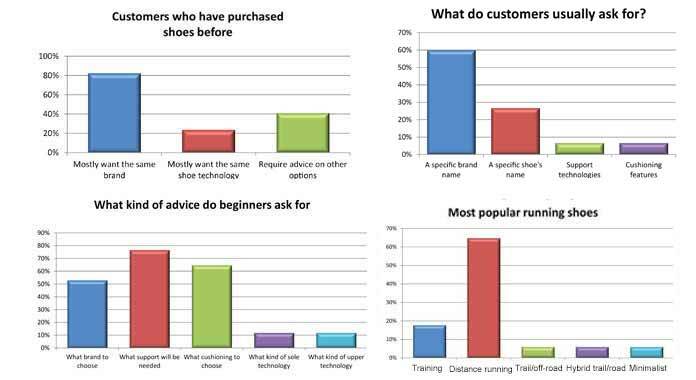 Bottom left: Customers that are purchasing for the first time running experience are most interested in advice on technical aspects the shoe has to offer and less worried about the brand of shoes they are purchasing, say retailers. Bottom right: Most of the surveyed retailers have found that distance running shoes are most popular whereas others have found off-road type activity shoes to be more popular in their stores. Running shoe customers are exceptionally brand loyal and mainly rely on personal experience when purchasing a new pair of running shoes. A brand that captures the attention of a first time runner can therefore acquire a lifelong customer — or lose a customer forever due to one bad experience. Sports Trader conducted a snap survey among South African retailers selling running shoes to find out more about some of the buying habits of customers looking for running shoes. More than 40% of the respondents are from specialist running stores, while 59% sell running shoes at general sport stores. The results paint a picture of the typical running shoe store customer that will hopefully help sales staff understand their customers a little better. Brand loyalty is very prevalent in the South African running shoe market, according to our respondents. 82% of them say customers who have previously purchased a running shoe want to purchase a shoe from the same brand — although 41% said that customers are also interested to hear what other options are available. A quarter of the respondents say that their customers ask for the same technology as in their previous shoe model. The first request from any customer wanting to buy running shoes is for a specific brand, say 53% of the retail respondents, while 24% say their customers will go as far as to ask for a specific shoe model. This brand loyalty does not mean that a customer will blindly purchase a shoe of the same brand, regardless of their experience. “We found that once a customer has a bad experience with a range in a specific brand they tend to want to move away from the brand as a whole,” says Werner van Heerden from VHF Sport. This means that a salesperson making a poor running shoe recommendation for a customer could result in that customer refusing to purchase the same brand in the future. Most (94%) of the respondents agree that customers who enter a shop having already decided which shoe to purchase, were influenced by personal experience. But, about a third (30%) found that their customers know what they want because they did their own research. Another big reason for a customers already knowing what they want is that they are simply looking to replace a previous shoe, and therefore want the same model and brand, according to 82% of respondents. Long distance running shoes are the most popular shoes. According to 65% of our respondents most sales are generated by long distance running shoes, while the second most popular shoes were training shoes — trailing far behind at 18%. Despite the hype around minimalist shoes, only 6% of respondents say that these shoes were the most popular among their customers. Most customers simply want “good value for money for a shoe that will do the job properly,” agrees Mike Augoustides from Mikes Sports. Several respondents mention that price is a significant factor when their customers buy running shoes. Having a knowledgeable running shoe salesperson at your store is very important as most customers require advice when purchasing a running shoe. According to 65% of the respondents even customers who have previously bought running shoes, still require advice when purchasing a new pair. Running as a sport is, however, growing, as 18% of our respondents said that most of their customers were beginner runners. Only 18% of the respondents said that most of their customers don’t require advice, as they already know what they are looking for. Most of them report that beginner runners are most concerned about the type of support and cushioning their running shoes will provide require. According to our survey, 77% of beginner runners will ask about support, while 65% will ask about the cushioning. Beginners also want advice on which brand to choose, and 53% of our respondents said that this is a common question. Since brand loyalty is so strong in runners, the sales person has a responsibility to recommend a suitable brand based on a sound knowledge of the features that will be best suited to his customer, as it may become his brand of choice for many years. It is the job responsibility of the salesperson to recommend the right shoe so that the customer has a pleasant experience while using the product. However, it is not always possible to convince an experienced customer to buy a specific shoe. “A runner knows what they want and no sales person will convince him otherwise,” says Gert Claassens from Tekkie Town. If you manage to convince a customer to purchase the right running shoe, it could mean that they will want to purchase a similar running shoe from you in the future, and you will gain a long time loyal customer. “Customers need to buy the correct shoe for specific type of terrain, distance and their physiological composition,” says Nick Velthuysen from Runners Rest.